This new collection of science essays (the twelfth book in a wide-ranging and popular series) displays both the concentrated information and imaginative scientific approach that have stamped Isaac Asimov’s writing with a well-recognized excellence. 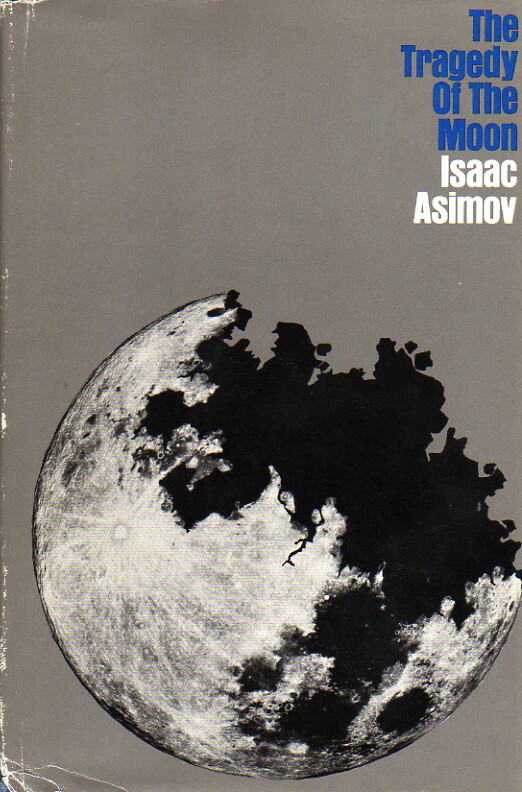 The contents of THE TRAGEDY OF THE MOON range between such diverse and engaging topics as the convincing Asimov argument for a more efficient calendar to how civilization would have benefited had there not ever been a moon, to the hypocrisy of those who deride technology, to notes on the energetic and prolific life-style of Asimov himself. And each of the seventeen chapters is a worthy addition to the volumes Dr. Asimov has contributed to everyone’s further understanding of the intricacy and wonder of our universe. This is among my favorites of Asimov’s F&SF essay collections, including a substantial number of my favorite essays. Of prime importance is “Lost in Non-Translation,” which I consider to be by far Asimov’s single most important essay, preaching (and yes, that’s the right word) a message of fundamental importance and in an impeccable fashion. Also high on the list, however, are essays like “The Cruise and I” (Asimov’s delightful recounting on his adventures on a cruise to see the launch of Apollo 17), “Doctor, Doctor, Cut My Throat” (on the thyroid gland—but it’s the autobiographical anecdote at the beginning that gives the essay its title and makes it so much fun), “The Tragedy of the Moon” and “The Triumph of the Moon” (on why the moon is so important to us and how it could have been even more important if only it had been elsewhere), and “The Ancient and the Ultimate” (on books). But the real threat to books, and what is likely to make Asimov himself antiquated is going, I think, to be multimedia. Indeed, Asimov’s later science juveniles for Gareth Stevens are themselves very multimedia-oid—emphasis on pictures, a certain amount of non-linearity to the text. I think this may very well be the wave of the future to coin a phrase. Meanwhile, the other essays are nice enough and nothing to gripe about—but they’re not the one that stay fixed in my mind; which doesn’t really matter, since the ones that do are good enough to leave this very close to the top of the heap of Asimov’s F&SF essay collections. And on a purely personal note, it was one of the first of Asimov’s books I purchased in hard cover. I must have been feeling unusually flush with cash at the time, as laying out a full $6.95 (plus tax) for a single book was rather extravagant for me in the 1970’s.